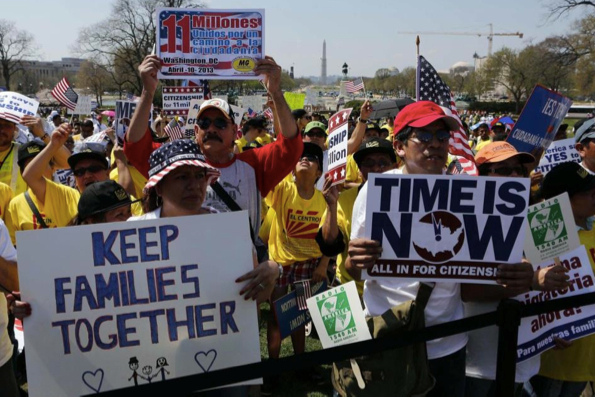 We demand Comprehensive Immigration Reform, ￼not a makeshift guest worker program! ￼Come out to encourage Darrell Issa to oppose this new bill ￼which could derail our efforts for real reform! We want to thank all club members for expressing interest in Comprehensive Immigration Reform and a very special thanks to those who made it out to The Dream is NOW Rally a few weeks back on May 30th at the County Administration Building. There’s a new bill being proposed called the Goodlatte’s Agricultural Guestworker Bill which could undermine the Gang of 8 proposals for real Immigration Reform. Although this is very short notice, we invite you to join OFA in the parking lot of Darrell Issa’s office in Vista on Tuesday at noon to show opposition for such makeshift measures as this which could derail efforts for real Comprehensive Immigration Reform. We don’t need a guest worker program for farm-workers at this point; we need true Reform! This event is co-sponsored by United Farm Workers (UFW), Border Angels together with OFA. Here is an analysis of the Farmworker Justice Analysis Goodlatte Bill HR 1773 which we are opposing and an Immigration VISIT Flyer (PDF). Please invite folks if you can and spread the word.